IPU CET 2019: Guru Gobind Singh Indraprastha University (GGSIPU), New Delhi will conduct the admission process for IPU MBBS / BDS 2019. The University will commence the application form in the month of February. GGSIPU is responsible for conducting the IPU MBBS 2019 admission & counselling procedure. GGSIPU will conduct counselling for all medical colleges affiliated to IPU & Delhi University. 4 medical colleges under IPU and 3 affiliated medical colleges of Delhi University will take part in the IPU NEET-UG Admission 2019. IPU MBBS Admission 2019 is based on the NEET score & NEET-UG Cutoff, CBSE will declare the NEET-UG result & cutoff. IPU is only responsible for conducting the counselling for the 85% All India Quota seats in the Delhi state. Check here all details related to GGSIPU MBBS 2019 admission. IPU MBBS Admission Criteria will be same as NEET-UG Eligibility Criteria. It will be compulsory to satisfy all the criteria prescribed by the authority of GGSIPU. Otherwise, Candidates will not get admission in IPU medical college or in any medical colleges of Delhi. We have mentioned the criteria below, you can check it. Candidates must appear in NEET-UG 2019 & obtained the required minimum percentile in NEET-UG. He/ She must be passed 12th from the any recognized board in subjects Physics, Chemistry, Biology & English. Candidates must have scored 50% marks in PCB & English in 10+2. For SC/ST/OBC, there will be relaxation of 10%. Only Indian/ Overseas Indian/ Nepal Citizen can apply for the IPU MBBS Admission 2019. Candidates who will appear in 10+2 or equivalent examination can also apply. IPU MBBS 2019 Application Form will be available on the university official site. Candidate will be able to fill the form online. It will be released after the releasing of NEET-UG 2019 Application Form. To appear in IPU UG Medical Admission Process, candidates should get registered for the admission. Visit the official website of GGSIPU i.e. ipu.ac.in. Click on “Registration for Admission” link present at bottom of the site or below the Admission 2019 Box. Form will be filled in the 2 steps. First will be General Information & other will be Qualification Details. Qualification details form will be opened on the basis of exam category selected in the general information form. Fill the general information form with all required details like exam category, candidate’s name, DOB, Father’s name, nationality, mail id, mobile no, address etc. Next step will be to upload the photo, signature & thumb impression. After filling the first form i.e. general information form. Click on the Next button. Second form will be open i.e. Qualification Details from. Now enter 10th & 12th marks or percentage, NEET score, NEET rank , NEET roll no etc. After filling the academic details, click on the next button. It will move to the next page that will be declaration page. Enter the captcha available there, click on the “I Agree” checkbox and then click on submit button. After clicking on submitting button, it will ask you check the form once as it will be not modified later. If you are sure about the details, you can click on the ok button to submit the form. After submitting the form, one alert will generate on the screen. To note down the login Id & password. After pressing on Ok button, form will open with generated Id & password. Candidate must note down the Login Id & Password. IPU Cutoff will be the minimum required percentile or marks must obtained by the candidates for the admission procedure in IPU or other medical colleges of Delhi. 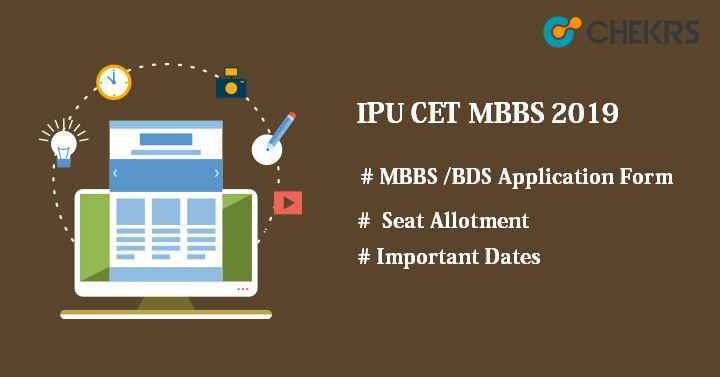 IPU MBBS Cutoff 2019 will be based on the seat allotment list released by the university authority. It will be released on the basis of various categories also. IPU NEET-UG cutoff will be declared after the final mop-up round counselling. GGSIPU will organize IPU MBBS 2019 Counselling for 85% state quota seats in Delhi state, in which affiliated colleges of Delhi University and GGSIPU will be included. The Counselling will be organized in the offline mode. Candidates who will be in the merit list can take part in the IPU NEET-UG Counselling. Applicants have to report at the allotted colleges or counselling venue on the given time & date along with the allotment letter & original document for verification. After the verification of documents, students will be provided options to select the available college of their choice.